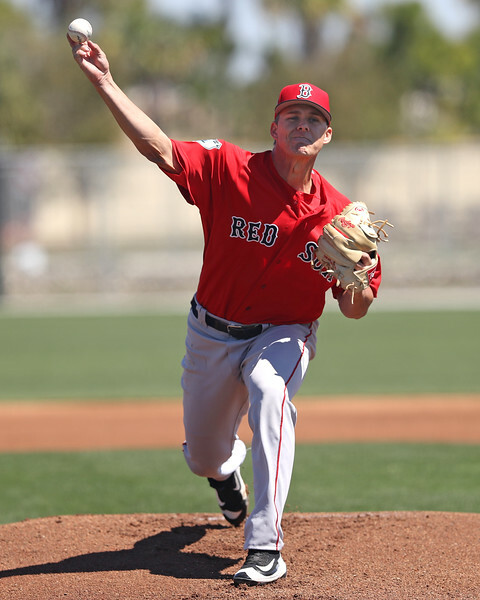 FORT MYERS, Fla. – As the SoxProspects.com staff trip to minor league spring training hit its groove, Director of Scouting Ian Cundall took in the Red Sox High A and Low A games in Fort Myers on Thursday. Here are his Notes from the Field. - Both A-ball games featured intriguing right handers on the bump for the Red Sox, with Bryan Mata (pictured) starting for Greenville and Shaun Anderson for Salem. 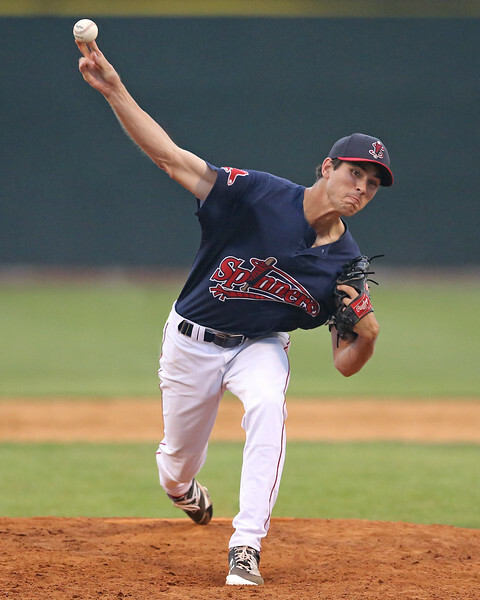 Mata threw two innings, striking out a pair and allowing two hits over two scoreless innings. Only 17 years old, Mata has a projectable frame, listed at 6-foot-3, 160 pounds. He looks a little heavier than that and has filled out some since the Fall Instructional League. Mata’s arm action is clean, his delivery controlled and repeatable. Mata’s fastball sat 91-93 mph with late tail. He had some trouble with his release point early and was missing up to the arm side. Once he found his release point, he showed the ability to locate the pitch down in the zone, including putting the pitch right on the outside corner at 92 mph to catch the left-hander hitting third in the Orioles’ lineup looking. I think Mata has more velocity in him, especially as he physically matures, and wouldn’t be surprised if in a few years he is sitting 93-95 mph with the pitch with a solid command profile. Mata featured both his curveball and his changeup and, encouragingly, his changeup looked much better than it did during Instructs. At that point, the pitch was inconsistent and sat 81-83 mph, but in this outing it sat 83-85 mph. He showed good feel for the pitch and threw it with deceptive arm speed. The pitch showed late fade and he was especially effective against lefties, generating three swing-and-misses. Development of his changeup will be key for Mata going forward, as his three-quarters arm slot gives lefties a pretty good look, so he will need a pitch to combat that. Mata’s curveball showed tight 11-to-5 break at 73-75 mph. When he gets over the pitch, he snaps it off well and is aggressive with it, attacking hitters, but in this outing he had some trouble finding the pitch. Though he is very young, Mata is one of the more intriguing pitching prospects in the system. 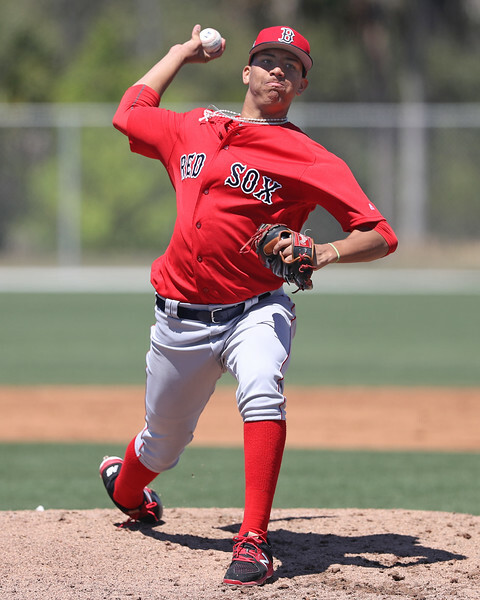 I think it is more likely that he starts in extended spring training and then heads to Lowell, but don’t rule out an aggressive assignment to Greenville to start the season, especially with the Red Sox feeling comfortable sending two 17-year-olds in Anderson Espinoza and Roniel Raudes to that level to start 2016. - The organization’s 2016 third-round draft pick, Shaun Anderson worked 90-92 mph in his start for Salem and looked much more comfortable in this outing than he did during his abbreviated time in Lowell last season. Anderson has the build of a starting pitcher, listed at 6-foot-4, 225 pounds. His delivery is repeatable, and coming from a high three-quarters arm slot, his fastball showed some late life. Anderson mixed in three secondary pitches, a cutter, a slider, and a changeup. His cutter worked 87-88 mph with sharp, horizontal movement; the slider at 84-85 mph with longer, more vertical, break; and the changeup at 85 mph, though it was on the firm side. The cutter and slider showed the most potential, though he did get caught in between them a few times. - Right-handers Stephen Nogosek (pictured) and Jared Oliver, both 2016 draftees who profile as relievers, showed off strong arms. In this outing, Nogosek’s velocity was down a tick from outings last year as he sat only 91-93 mph, but his slider flashed above-average showing hard, two-plane movement at 84-87 mph. Nogosek’s delivery is max effort with a head whack and quick arm. The 2016 sixth-round pick out of the University of Oregon made it to Greenville last year and looks like someone who could be fast-tracked to the majors. We project him to start his first full season with High A Salem. Oliver, who signed for only $10,000 as a 26th-round pick out of NAIA Truett-McConnell, sat 92-94 mph and touched 95 mph. Oliver has an average frame and has effort in his delivery with a short, quick arm action. Oliver featured a slider as his primary secondary pitch, showing long, 10-to-4 break at 84-85 mph. The pitch was loose and lacked bite. With the last pitch of the outing, Oliver threw a short, power curveball at 78 mph that resulted in a strikeout looking. The pitch had depth and was better than any slider he threw. - The Salem lineup included Bobby Dalbec (pictured) and Tyler Hill. Dalbec’s results were a mixed bag, as he hit the ball hard once but also struck out on a slider down and out of the zone. He also had some trouble in the field, throwing away a slow roller and not reacting quick enough and getting caught flat-footed on a line drive a little bit to his left. The line drive was hit hard, but should have been caught. Hill turned on a fastball and hit a home run to left field. He put a good swing on the ball and did a good job clearing his hips and staying inside the baseball. Hill also had a couple poor swings, showing poor pitch recognition skills and over-aggressiveness in swinging at pitchers’ pitches. Inconsistency is theme I saw with Hill all week, as it seemed that every good thing he did was cancelled out by a mental error or mistake: Wednesday in Port Charlotte, he was picked off first to end the game, and on Saturday he got caught stealing third base, with Dalbec up, on a play that wasn’t close. Hill also misplayed a fly ball over his head in left field, taking a poor route and getting turned around. Though Hill shows some ability at the plate, the rest of his game lags behind and limits his upside. 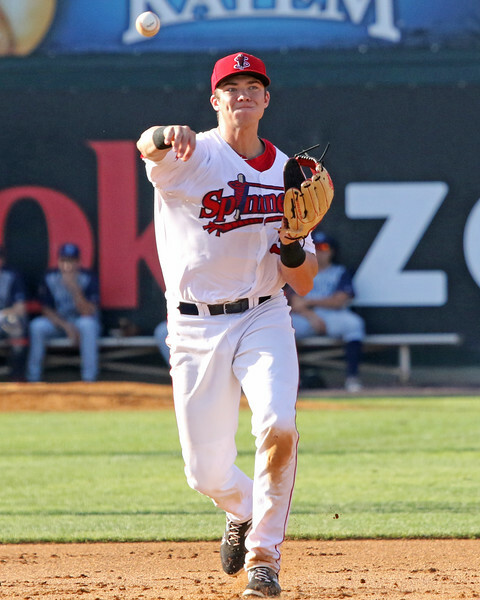 Intriguingly, Hill did work out a bit in center field during the week, playing some innings there in game action when SoxProspects.com Executive Editor Chris Hatfield was watching. If he is able to passably play there, rather than being stuck in a left field-only profile, that would be a boost for his potential value, but I have not seen anything yet that would suggest he will be able to man the position.